Is This The “True Face” of Shakespeare? You may have heard by now of the earth-shattering claim made by world-renowned academic journal Country Life that they have identified the only true likeness of Shakespeare, created when he was 33 years old and in the middle of writing Hamlet (having just knocked out Midsummer Night’s Dream). My first thought was, “Meh, I’ve been fooled by these before.” My second thought was, “It’s a line drawing. It’s not even a portrait.” He looks a bit Dionysian(?) with a laurel wreath atop his full head of curly hair. In other words, entirely generic. Then my Read It Later feed, which tracks Shakespeare references from various sources, blew up. Could this be real news? Or just a carpet bombing press release? Probably the latter, but I had a moment and chose to investigate. There’s this engraving in this botany book, that has four people in it. One of them is holding an ear of corn. Bingo bango, that’s clearly a reference to Titus Andronicus, and obviously this is a picture of William Shakespeare. I mean, I’m sure there’s more to it than that, but if that’s the kind of “evidence” we’re going to be working with, then I think these guys need to get back in line behind the other hundred years of supposed discoveries. Next week, as a result of this discovery, Country Life will reveal a new play by Shakespeare and how his career was launched. What I’d like all these “code crackers” to answer is, why? 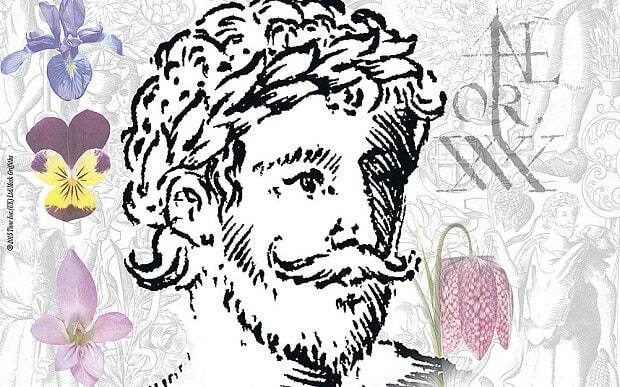 Why, when Shakespeare is just 33 years old, a few years post- Greene’s Groat’s-Worth of Wit and with the best part of his career ahead of him, would this dude writing a botany book decide to hide his picture? For bonus points, apparently one of the other four figures is Lord Burghley, Queen Elizabeth’s treasurer. So the true revelation is clearly that the real identity of Shakespeare is hidden behind the clue of Lord Burghley, who many believe was the model for Polonius. Lord Burghley is the father in law of? Edward de Vere, Earl of Oxford. Just so we’re clear, I made that last part up. ‹ PreviousHow Old Does Microsoft Think Shakespeare Is? Looks more like Richard Burbage to me. Here is a pretty well done critique of what can be called "Science by press conference." Somehow a glossy weekly magazine specializing in gardening does not seem a likely place for serious Shakespeare scholarship.